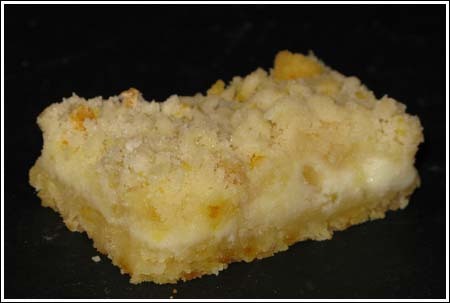 This recipe for Pineapple Cheesecake Squares is adapted from The Wellesley Cookie Exchange. The original recipe does not call for a food processor, but if you have one, I highly recommend doing the whole recipe in it. Of course, you can always use a pastry cutter and some elbow grease. These were fabulous and not overly sweet. The orange zest really adds to the overall flavor, so don’t leave it out. As for the pineapple, I used the dried, diced, sugar coated type that you find in the bulk bin. It was pre-chopped, but you could also chop up candied, sugar coated rings which look like this. I plan on making these again soon – maybe with some nuts on top. My only complaint is the top crust is a litte pale. Preheat oven to 350 degrees F. Line an 8 inch square metal pan with foil and spray foil with cooking/baking spray (or just use nonstick foil). Pulse flour, sugar and salt in food processor to mix. Add butter and pulse until mixture has the consistency of cornmeal. Add orange zest and pulse once or twice more. Measure out 1/2 cup and set aside. Dump remainder into pan and press into bottom. Bake for 12 minutes or until lightly browned. Meanwhile, wipe out food processor or switch bowls. Process cream cheese and sugar until creamy. Add lemon juice and vanilla and process another 30 seconds, scraping sides. Add egg and process for another 30 seconds. Add pineapple and pulse just until mixed. Pour this mixture over baked crust and spread to ends. Sprinkle reserved crumb mixture over top. Return to oven and bake for another 15 minutes. Let cool completely, then chill for at least two hours. Grasp foil, lift bars from pan and cut into squares. there was a question about freezing, I’ve had an easy time freezing cheesecakes, so that would work great for these cookies. I’m going to make them with a different fruit, not a huge fan of dried pinapple. Of course I love to eat it fresh! These bars look really yummy! I discovered this great new cookie site that actually has a recipe for oatmeal cookies *stuffed* with a cream cheese filling — you can find it at typepad.oatmealcookie.com. Worth checking out! I have a shindig where I need to bring a dessert on Friday night and want to make these, do you think they can be frozen. I’ve never really tried to freeze anything with cream cheese. Although I know you can buy cheesecakes in the frozen food section. Just wondering what you think. I will probably put some chopped toasted almonds on top–gotta have nuts on everything! KAnn, I do have that book. I was just reading it the other night. It has a lot of interesting recipes. There are a few that I plan on making one day before I die and others that don’t appeal to me one bit even though they are chocolate chip. NP, I’m glad it cheered you up. BTW, I have a Chardonnay recomendation for you if you see this. It’s called Kali Hart. Catherine and Laurie, I emailed you both and am looking forward to hearing what you think. Awesome! My youngest daughter LOVES dried pineapple, so I’m making these, stat! Great idea! Well, it cheered me up and it’s now Tuesday. These look great. I bought the Wellesley Cookie Exchange about 20 years ago and haven’t looked at it for the longest time…I acquired the Search for the Best Chocolate Chip Cookie about the same time and always think of you when I look through it…do you have that one, Anna? Midge, I wondered the same thing. My worry was that the pineapple might add too much moisture. I’m not really sure it would work, but the dried candied pineapple worked very well. If you can find it, give it a try! I think the pineapple flavor might be more concentrated. Yes! Indeed there was. I was worried that that bar might be too sweet. Also, it calls for macadamia nuts and I didn’t want to deal with that. So I tried this one. At some point, I’ll have to try the Food TV bars. These look divine. Could you use a can of crushed pineapple drained very well?